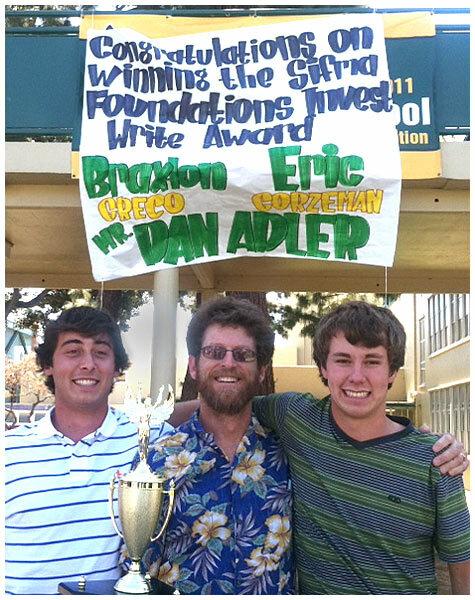 Poly High School microeconomics students Braxton Greco and Eric Gorzeman earned honors recently for their essays in the national InvestWrite competition. Among the nation’s high school students, Greco was the national winner, and Gorzeman placed fourth overall. The students and their Advanced Placement microeconomics teacher, Dan Adler, were honored in front of Poly’s student body during a surprise lunchtime ceremony at the school. WISE INVESTORS—Poly High School students Braxton Greco and Eric Gorzeman earned high honors in a national writing competition about the stock market. Joining them, center, is their microeconomics teacher, Dan Adler.